I love my writing space. I have a large Mac computer where I do most of my writing. It sits in a corner of my office surrounded by bookshelves, writerly magazines, and notepads. I wish I could say I keep the desk clean, but paper clutter is a constant struggle for me. I’m always working on something, taking notes for something else, and keeping track of things to do. I’m sure I’m not the only writer who fights the paper demon. I also have a weakness that often overtakes my office–I love books. I have too many but there is always another one I want. Fiction, nonfiction, poetry, short stories and anthologies all beckon me. If I lived in a larger home that wouldn’t be much of a problem, but we live in an 800 square foot mobile home! I’m happy here; it’s the perfect size home for us, set in the perfect location. I know I just need to read faster so I can pass the books on. My office inspires me. When I first enter the room I see a few writing awards I’ve received hanging on the wall. I have encouraging quotes and affirmations around my desk area that I can easily see as I’m writing. And some interesting images and fun pieces of art make me smile when I glance at them. All of these things spark my creativity. But what about sparking my productivity? I’ve had to resort to using an egg timer. That’s right. I have an egg timer on my desk. I use it to limit my time doing things that I find irresistible that aren’t writing. The major temptation that takes me away from writing is Twitter. Followed by Pinterest. Both of these distractions are so enjoyable that if I don’t watch myself, I can spend hours every day there. The egg timer is my only defense to ensure I stay productive and create new material everyday. I also use the egg timer to trick myself into doing tasks that I don’t feel like doing. I’ll say to myself, “You only have to spend 25 minutes editing this piece” or “Just take 15 minutes to read email.” If I don’t do a little bit at a time, then the task piles up into a really unpleasant chore. So the egg timer serves a dual purpose, and I found a cool looking one. 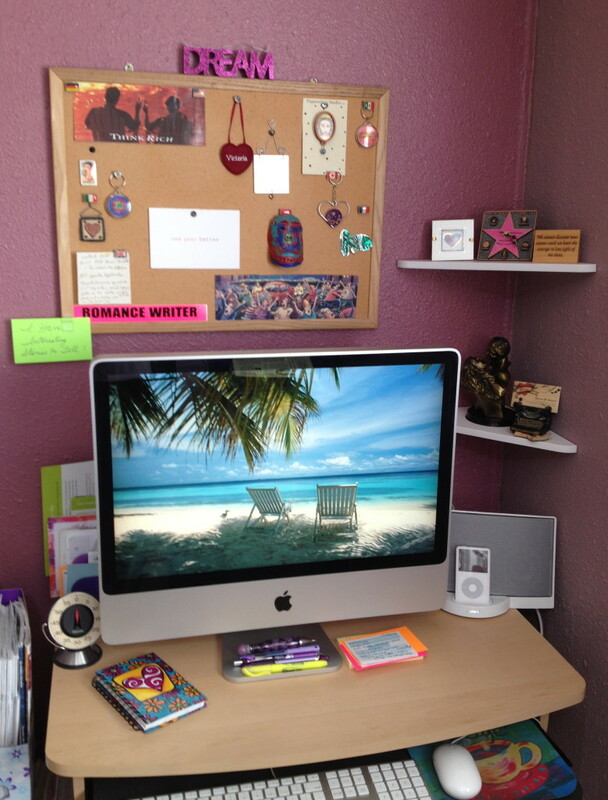 Victoria finds inspiration in her small corner desk space. My husband and I have lived in this home for nearly three years. I created a short story collection titled, The Substitute Bride, while living here. I’ve also written my first poem and several more poems since moving here. I’ve worked on film projects in this home. I’m editing two major pieces that were partially written in our previous house: one is a mainstream thriller and the other is a nonfiction book. And I’m working on a new short story collection. I’m eager to return to a romance novel that I entirely mapped out last year, but I got distracted by my publishing house (Avalon Books) selling to a new publisher (Montlake Romance) and I decided to wait until all that dust settled before writing it. I don’t listen to music while I write, but I do like music when I’m on social media, tidying up my office, or handling the business aspects of writing. I don’t look out the window of my office because that distracts me. But I sometimes sit by the window of our dining room when I write poetry. My office is my creative sanctuary. My writing style is reflected in this space. One glimpse at my office and you’ll know this about my writing: 1. I have an optimistic outlook. 2. I believe in clearing away clutter and leaving only what’s absolutely needed 3. Timing is everything, and 4. I adore intriguing images. No matter the size of your space, make it an inviting atmosphere. Then, once there, write. Fight off the distractions. Protect your writing time. Only you can control your productivity. You also need to fight off insecurities about yourself as a writer. Many writers experience doubts at one time or another. Write down affirmations and post them near your computer. One of mine says, “I have interesting stories to tell.” Another says, “I have a unique voice.” I see them everyday and these help boost my confidence. Write four or five and post them where you’ll see them. Bio: Victoria M. Johnson is published in fiction and nonfiction. She also writes and directs short films. Read her full bio here. You’d make her happy if you followed her on Twitter and Facebook, or even Pinterest.